I thought I would take a little inspiration from my real life this week to write up this post. Like I mentioned last week, I've been suffering from a horrible cold in addition to a case of pink eye that has lasted over a week now. Being sick can be very frustrating, especially if you've got a lot on your to do list. Since I'm in college, being sick is stressful because it can make you miss class (I missed 3/5 days of class last week!!) and can make catching up difficult when you aren't sure if you're getting all the information you missed. I always end up stressing myself out when I'm sick because I have so much that I have to do and think about, but I have to remember that stressing out will ultimately make things worse. So when I'm feeling sick and overly stressed I have a few things that I like to do to relax to make things better. 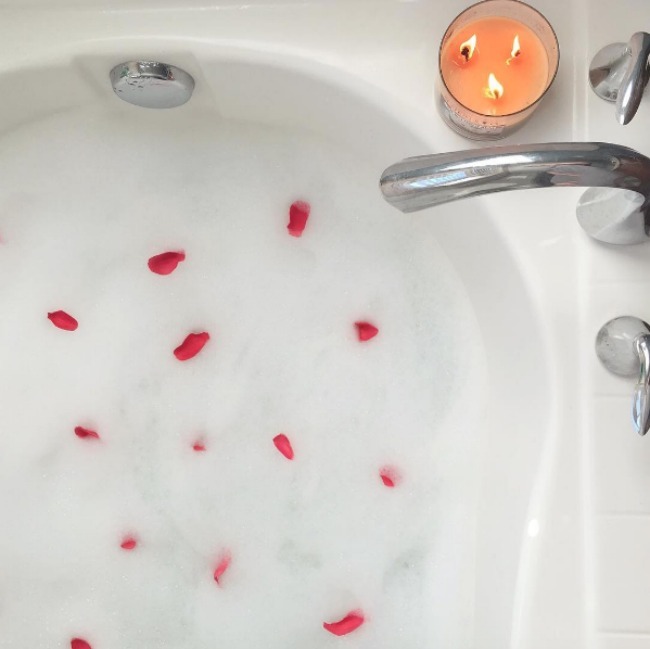 Here are my 5 favorite ways to unwind and feel better, both physically and mentally, when I'm sick or stressed! It might just be me, but a hot shower is my favorite thing when I'm sick. It's horrible for the drought, but I often take at least 2 showers a day when sick because it opens up my sinuses and relaxes all my muscles. If I'm really feeling stressed though I'll take a bath and add in some nice smelling bubble bath so I can soak for a good long while. Funny story, I actually used my bath tub for the first time in my house at school the other day and was so confused because I couldn't get hot water to run! I ended up having to twist the one handle all the way around until I thought I broke it, but it turns out it was just stuck. Okay, so not that funny of a story, but still something to share, haha! There's nothing better than putting on a movie that you've seen so many times that you don't have to put any effort into watching it. My go to is Bride Wars with Anne Hathaway and Kate Hudson. I've seen it a million times in all its cheesy glory and have everything memorized, so putting it on puts me directly in my happy place. I suggest anything light and warm-hearted, a few of my other favorites are 13 Going on 30, How to Lose a Guy in 10 Days, The Wedding Planner, and What's Your Number. What is it about making your bed that makes it 1000x more comfortable? I just bought these flannel sheets from Target and they are SO nice. (And cheap, holla!) After suffering for a few days, and realizing I had pink eye I decided to do a total decontamination overhaul and washed all the clothes and sheets that were just sitting in my room. I put my fresh new sheets on and immediately took a nap. It was the best I've slept while sick this week, and it was also the best decision I've made. Sometimes a nap can really fix anything, especially if your sleep schedule has been thrown off in one way or another. 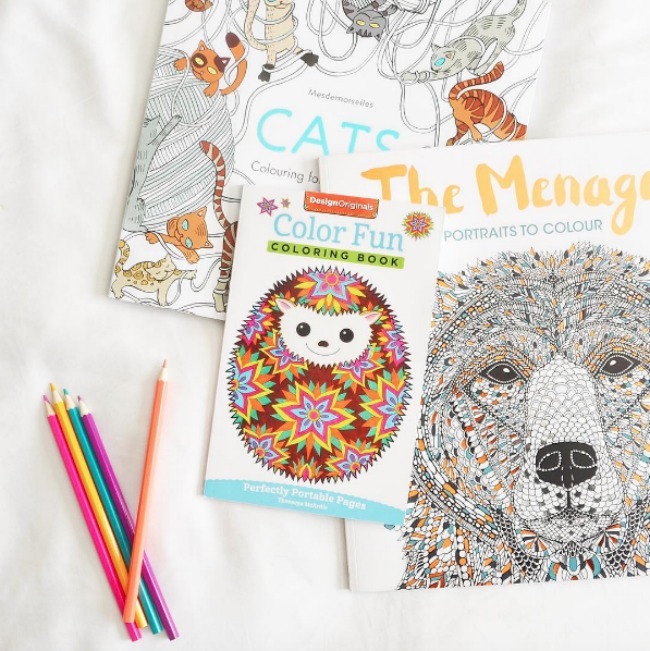 Bring out your inner child and grab one of those adult coloring books that are so on trend right now. I have three of them and love to pull them out when I have some extra time on my hands. They're also great for relaxing! I find that if I'm super stressed or can't seem to keep my focus because of all the 'sick' symptoms I can pull out one of my coloring books and it helps me to put all my focus into the drawing. It doesn't relieve all my stress, but it does make me feel a little better once I'm done coloring! I asked on Instagram what your best tips were for getting rid of a sore throat and this was overwhelmingly the number one answer! Although I'm not a fan of tea I wanted to add this to the list because I know it helps so many people! If you're like me and you're not a fan of tea, I recommend having hot apple cider. The warmth of the drink will partially soothe your throat (not as good as honey, but it will do!) and help you to relax. My throat always seems to get sore when I'm sick and it's one of the number one reasons why I can't function during the day. If I'm constantly bothered by my throat I won't be able to sleep well, so having a warm cup of something typically helps right before bed. What are your best tips to relax or feel better when sick? Aw hope you feel better hun! Loved your post, very informative! I'm sos sorry you are sick. I hope you feel better soon. It sounds like you are taking extra good care of yourself with these wonderful tips! Love these tips! Glad I already do some, makes me feel like I'm doing something right! Oh my goodness, I love apple cider and I never thought to drink it when I'm sick! I wish dorms had bathtubs, because they always help with distressing! I hope you're feeling a lot better! Taking a bath then crawling into a cozy bed with a cup of ginger tea and a good movie is the best way for me to feel better when I'm sick! Spending time with my cat helps amazingly! I'm all about baths when I'm not feeling well! Also hot water with lemon and honey is my go to drink for everything!! Absolutely loved this post! Such wonderful tips. I hope you feel better, girl! Oh no. I hope you feel better soon. Missing your classes and catching up is always so hard and can be stressful. 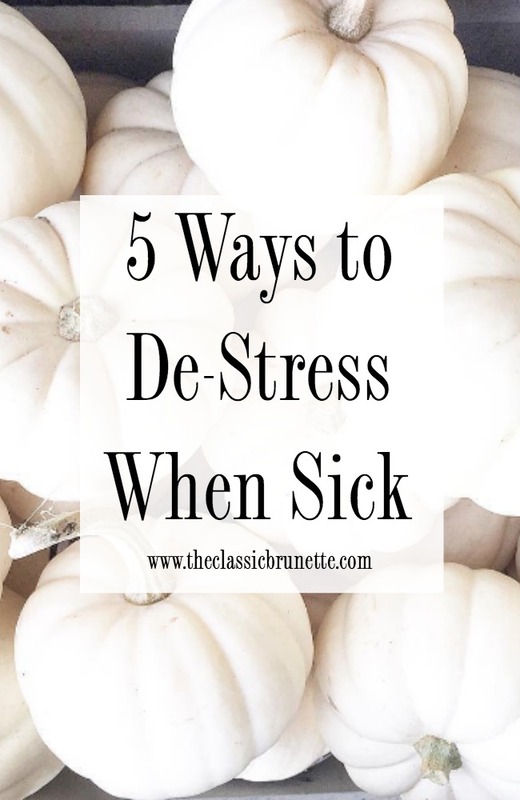 Thanks for sharing these helpful ideas to de-stress and feel better when you are sick. I love to drink ginger tea to cure my soar throat. Great post! This is so important and I love your 5 ideas! Tea & warm baths are my favorite when I'm sick. I hope that you are feeling much better! Isnt getting sick during winter the absolute worst? Great tips for taking care of yourself! Girl I totally feel you! I've already had my first TWO fall colds and I always end up feeling so bad because my to-do list is massive and all I want to do is sleep. It can be so difficult to not give yourself a hard time and rest up. I always love to watch movies but I love it even more when I'm sick and have less choices of what I can do. When I was little and was sick I always watched Pocahauntas and wish I had it still to watch when I'm not feeling well. Hope you're feeling better now. This is perfect for me, as I feel I am on the verge of a cold and can't afford to slow down! Thanks for the tips! Lots of great ideas to incorporate when I need to take a break from our constant renovating! I can't wait to finally install our vintage clawfoot tub in our master bathroom!!! These are SUCH great tips! I am always trying to de-stress, and I love adult coloring books! Love this! I'm such a big fan of taking a bubble bath with a big glass of wine and a movie playing whenever I get too stressed. These are all great tips! I hope that you're feeling better soon, I've had a sinus infection all week, but think I'm finally on the mend!